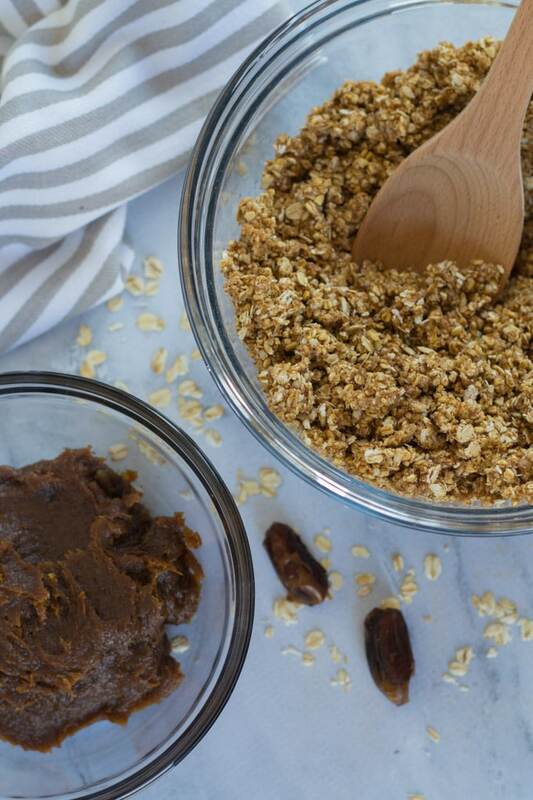 Are you in the mood for some healthy, wholesome Oat and Quinoa Date Squares? 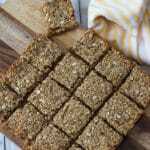 This recipe has lots of fiber, protein and clean eating ingredients like oats, quinoa, almond butter, dates and honey. 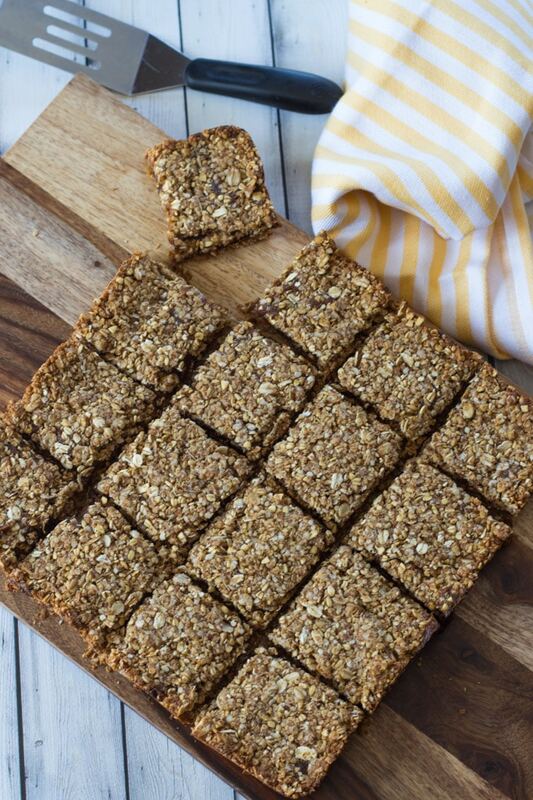 These date squares make the perfect on-the-go breakfast, mid-morning snack, and, of course, dessert. I’m pretty excited to share this recipe! So, you already know that I love carrot cake, and it is usually my go-to birthday cake. (I’ll definitely be requesting this Coconut Carrot Bundt Cake for my birthday this year 🙂 . Well, I also enjoy a good date square, and have been known to request these for my birthday too! Actually, truth be told, I enjoy any kind of crumb topped square/cookie (hence, the name of my blog!). But there is something about the crumbly texture of sweet, baked oats paired with softened dates that is just so delicious. So, no surprise, but when I started clean eating, I made it my mission to create a clean date square recipe. And that’s when I came up with the ingredients for these Oat and Quinoa Date Squares. Once I decided to cut out a lot of processed foods (or at least try to! ), I made my way to Costco and purchased steel-cut oats, quinoa, almond butter, dates and a number of other items, all in bulk sizes! Needless to say, these items are now staples in my house. (Okay, so I bought so much I had no choice but to make them staples!). And now with all the ingredients on hand, I usually whip up a batch of these Oat and Quinoa Date Squares every few weeks. That also means I’ve had lots of time to perfect the recipe before sharing. And by perfect, I mean, finding the perfect ratio of oat/quinoa crumbs to ooey, gooey date filling! So now that you know this recipe has been thoroughly tested, let’s get to the ingredients! For the crumbly oat/quinoa base and topping, I used steel-cut oats, large flaked oats, and quinoa flakes. Side note: I found quinoa flakes at Bulk Barn. And I will admit I didn’t know they existed and only found them because I enjoy strolling up and down the aisles at Bulk Barn looking for inspiration and unique ingredients. Most of the time I have no real plan for what I purchase, but I always have a plan to experiment in some way! If you don’t have quinoa flakes, no worries, you can use additional oats. But I would definitely use the two different types of oats in this recipe. The large oat flakes and the smaller (nuttier looking) steel-cut oats, provide a nice contrast in look and flavor. I decided to sweeten up the dry ingredients with a little bit of coconut sugar and cinnamon and then stuck the dry ingredients together with a honey/almond butter mixture. To bring this combination to a crumbly texture, the easiest thing to do is just throw your hands into it. This can obviously be messy, so you can also use an electric mixer. I first tried stirring the mixture together with a spoon, but using your hands or a mixer is much easier! 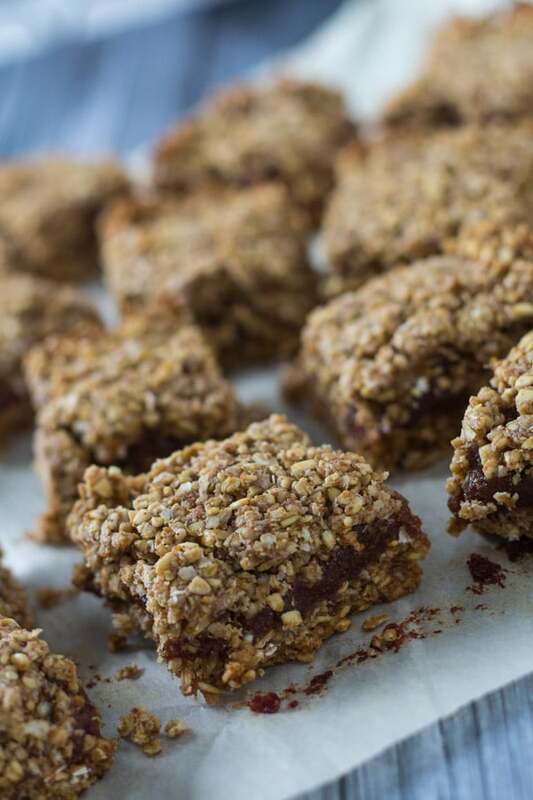 Another thing I’ve learned after making these Oat and Quinoa Date Squares multiple times is not to leave the date paste at room temperature for too long. As I was taking photos while making this recipe, the date paste cooled before I had a chance to add it to the crumb base. This made the paste extra sticky and a bit difficult to spread. Don’t get me wrong. The squares still turned out well, but it did require a bit of patience. So, I’m just saying, don’t dilly dally while making these! I’m not sure why you would want to though! The sooner these Oat and Quinoa Date Squares get in the oven, the sooner they can get in your belly 😉 . 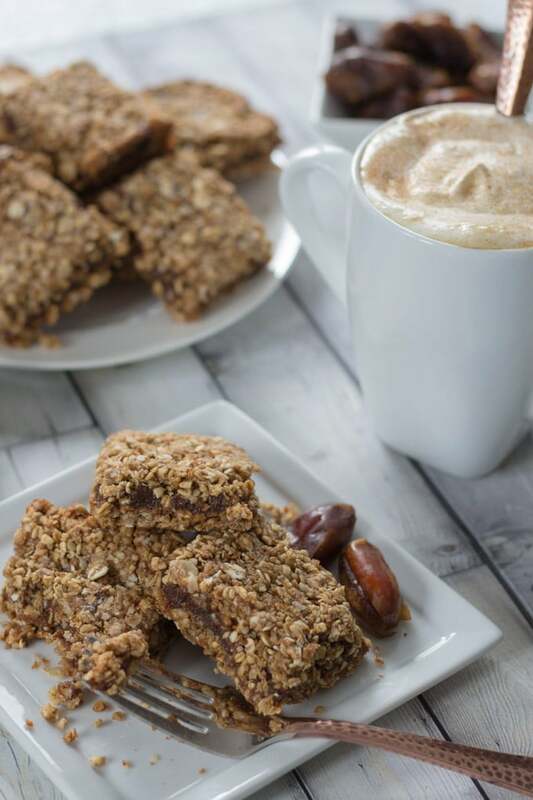 These Oat and Quinoa Date Squares are full of fiber, protein and clean eating ingredients like almond butter, dates and honey. They also have two different types of oats as well as quinoa flakes. 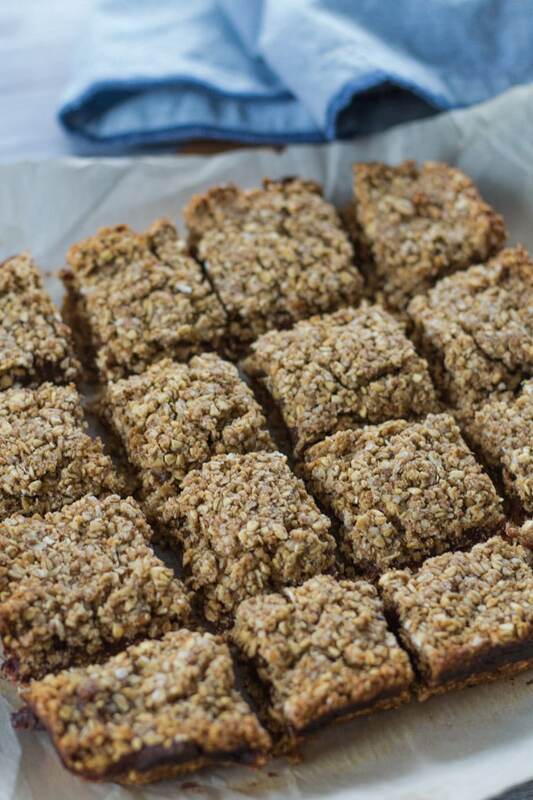 They are super delicious and make a great on-the-go breakfast, mid-morning snack, or dessert! Pre-heat the oven to 350 degrees and grease a 8″ square baking pan. In a large bowl, combine the steel-cut oats, large flaked oats, quinoa flakes, coconut sugar and cinnamon. In a small bowl, stir together the almond butter and honey. Add the almond butter/honey mixture to the oat/quinoa mixture and stir until well combined. (Use your hands or an electric mixer). In the meantime, add the dates, maple syrup and almond milk to a medium-sized sauce pan and simmer on low heat for 15-20 minutes. If the mixture comes to a boil, that’s okay. Just reduce the heat and keep stirring so it doesn’t burn on. Once the dates have absorbed the liquid and softened, remove from heat and mash with a fork or a potato masher. For a smoother texture, use a blender (be careful as the mixture will be hot). Blend on high until mixture becomes a smooth paste. Pour half of the oat/quinoa mixture into the greased pan and press firmly to cover the bottom of the pan. Next, spread the date paste over the crumb mixture. Then add the remaining oat/quinoa mixture on top of the dates and press firmly to cover the top. Place in the pre-heated oven and bake for 25 minutes. Once cooled completely, gently lift the date squares out of the pan with a knife and cut into 16 pieces. The date squares can be stored in an airtight container on the counter for 3-5 days. You can also freeze them to enjoy later. I suggest using an 8″ square plan, but if you want a thinner date square, you could use a 9″ square pan. I did this once and it was fine. Just note that the date paste will need to be spread out much thinner in order to cover the crumb base. When mixing together the almond butter and honey, if your almond butter is a bit firm and doesn’t easily combine with the honey, just pop the mixture (both the honey and almond butter) in the microwave for 30 seconds or so to soften it. I used whole pitted dried dates in this recipe. But I’ve also used chopped medjool dates. Both work well in this recipe. If you chop your dates, the stewing time may decrease and they may be easier to mash. Also, medjool dates are a bit softer than dried dates. It is best to spread the date paste on the crumb base when it is still warm. Once it cools it becomes stickier and more difficult to spread.